Some time back when Dr. Bhai Harbans Lal was visiting us, one day we were talking about the problems that Sikh youth in the Western countries were facing. Being in Judeo-Christian milieu and with their distinct physical appearance they were subjected to innumerable questions regarding their form and beliefs from their peers. Due to lack of any formal education in their religion and relatively limited help from their parents these young Sikhs were unable to give any satisfactory answers to such rather penetrating questions. It was therefore felt necessary to provide them with a suitable body of information so that they could gain sufficient background in teachings of Sikhism and to be able to satisfy their questioners and thus relieve themselves of frustration resulting from the feeling of inadequacy. Bhai Harbans Lal suggested that the book, "Sau Suwal", by Principal Satbir Singh contained the necessary material for this purpose. It should therefore be translated and requested that I should take upon myself the responsibility to do so. He promised to help me in this task by providing some starting material. Those days I was giving a class in Sikh Philosophy at a local university and had independently reached a similar conclusion after talking to my students. A word of encouragement acted as a catalyst and I readily agreed to start the work immediately. A major portion of my translation of the book resulting from my first effort was published in the Sikh Internet Daily Newspaper,"Sikhe.com". I received many encouraging comments for this effort. I then examined the whole work and revised it. Where necessary, I added commentary and explanatory notes in order to make it more readily comprehensible to the Sikh youth in the West who have very little or no formal background in Sikh youth and teachings. 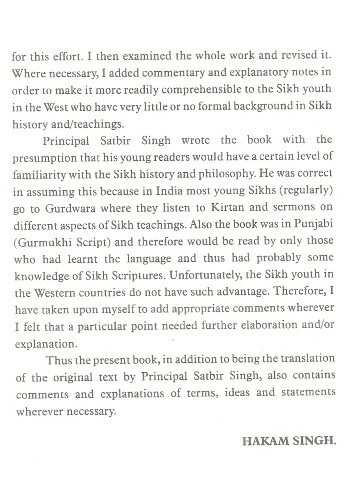 Principal Satbir Singh wrote the book with the presumption that his young readers would have a certain level of familiarity with the Sikh history and philosophy. He was correct in assuming this because in India most young Sikhs go to Gurdwara where they listen to Kirtan and sermons on different aspects of Sikh teachings. Also the book was in Punjabi and therefore would be read by only those who had learnt the language and thus had probably some knowledge of Sikh Scriptures. Unfortunately, the Sikh youth in the Western countries do not have such advantage. Therefore, I have taken upon myself to add appropriate comments wherever I felt that a particular point needed further elaboration and explanation. 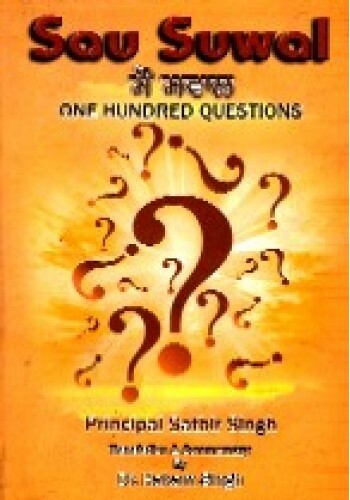 Thus the present book, in addition to being the translation of the original text by Principal Satbir Singh, also contains comments and explanations of terms, ideas and statements wherever necessary. Posters of Sikh Saints and Warriors on Photographic Paper in Excellent Print Quality -..
A Brief Account Of Life and Works Of Guru Gobind Singh - Book By Trilochan Singh &n..